The vibrantly beautiful artwork depicted in the photograph above is the first in a series of five lithographs created by noted Texas artist Billy Hassell. The art series has been commissioned to celebrate the wild things and wild places of Texas with proceeds benefiting on-the-ground conservation efforts. The first edition lithograph depicts Powderhorn Ranch, one of the last remaining tracts of unspoiled coastal prairie in Texas. To find out where to get one of these limited edition lithographs and contribute to this effort, click here. Watch a video of how this beautiful piece of art was created. One of the most ambitious species conservation projects underway in Texas right now is restoring native pronghorn in West Texas. Late last month, scientists with the Borderlands Research Institute and Texas Parks and Wildlife Department translocated 112 of these majestic animals from the Panhandle to the Trans-Pecos to bolster populations. It’s all part of the effort to bring pronghorn back to the area. Scientists report that pronghorn populations in the Trans-Pecos are responding well to good range conditions and wildlife management efforts; these encouraging signs point to successful survival for the animals moved here last month. Texas Parks and Wildlife Foundation is a proud supporter of this effort. Conserve iconic Texas species like the pronghorn by becoming a member of Texas Parks and Wildlife Foundation today. 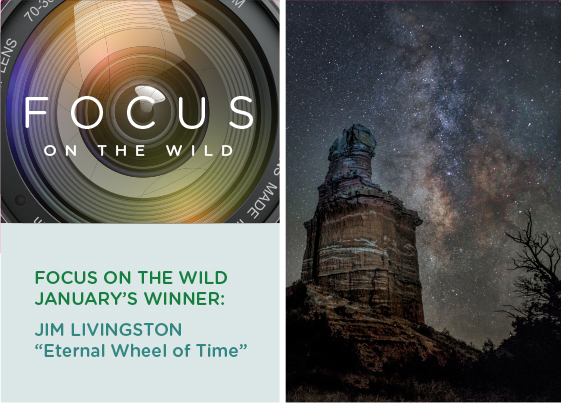 Congratulations to Amarillo resident Jim Livingston for being the first winner in our year-long photo contest! This stunning photo of the Lighthouse at Palo Duro Canyon State Park during the 2015 Perseid meteor shower really impressed our judges. We’ll be sharing this beautiful photo on our website and on social media channels. As our winner, Jim also won a new YETI cooler. This month’s photo contest theme is Rivers and Streams in Texas. To have a chance at winning, be sure your photo fits the theme and is submitted by the 25th of February. Read the contest rules to find out more. Good luck – we're looking forward to seeing and sharing our state’s beautiful rivers and streams! This was supposed to be a cute little story about wildlife that mates for life. But as often happens when you ask a Texas Parks and Wildlife biologist a question, you don’t get the answer you expect. We did get a list of critters with “high mate fidelity,” as a biologist would say, including whooping cranes, coyotes and osprey. But, there are exceptions. Not quite the Valentine’s story we had in mind. The complexity of nature is always a surprise. Watch this month’s Take:30 with Nature and enjoy a rare view of the majestic whooping crane. That’s something anyone could love!